When we last saw the hegemonic colonial ethos come face to face with history and good taste, my new hero Bob Costas was decrying the bigoted, anachronistic, but long-lived name of the Washington, D.C., American football team. I won’t even repeat it here. But I can certainly make you squirm with some never-before-tried discursive equivalents. Imagine the Pittsburgh Pollacks, or the Cleveland Kikes, the Wisconsin Wetbacks, or the Arizona Amish. I think you get the picture. I foolishly thought that once the lid was off, and the name “Redskins” finally crept back under the rock out from under which it first crawled into the light of day, a new, possibly culturally sensitive replacement would prevail. Talk about wrong! 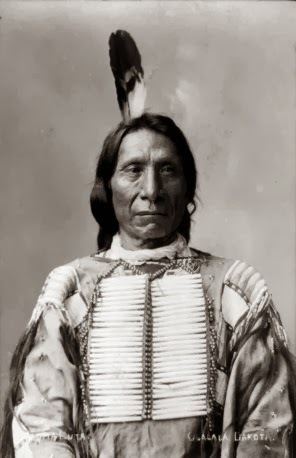 Oglala Lakota Chief Red Cloud (1822–1909). I can’t condemn these guys for their earnestness. 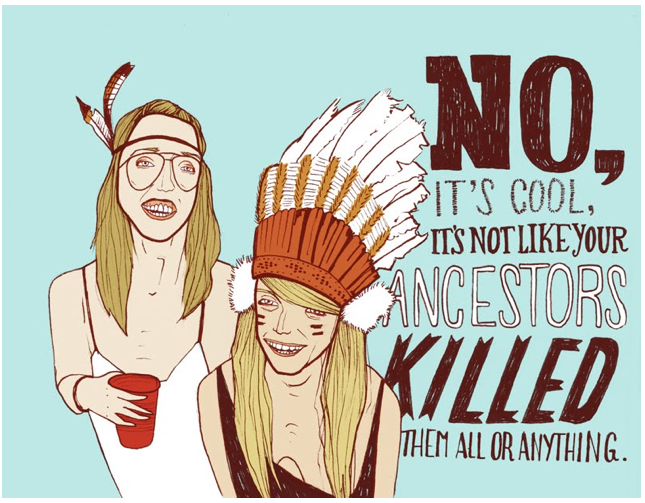 But to begin to redress, at a minimum, decades of humiliation of the original inhabitants of this continent, and lifetimes of cultural and ethnic cleansing up to and including strategic massacres and forced relocation, the NFL is gonna hafta do a lot better than propose this non-starter—at least from this anthropologist’s point of view. Every word of this Washington Post article vibrates with the same lordly self-righteousness that presided over the original name. Drury and Clavin suggest that calling the team the Washington Red Clouds would heal old wounds and show the NFL establishment and the American people’s respect. They believe that the suggested team mascot would please all of the living descendants of this continent’s original inhabitants. Why? Because Red Cloud was the Sioux man who united a fifth of what’s now the lower 48, and alongside his nation battled the U.S. government to a stalemate in the 19th century. Did anyone ask his living descendants if they thought this was a good idea? [Obviously they couldn’t ask Red Cloud.] So, by what right do Drury and Clavin, the Washington franchise owners, or the NFL brass steal the man’s name? If you’re a fan of conundrums, riddle me this. First you call yourselves “redskins” because you want a team name that would evoke the ferocity and cunning of the American Indian. But, you can’t think of another way to refer to Native Americans, as a group, except by using an epithet that was always meant to diminish and subjugate a people. Thus, the suggestion of the new name, even in the enlightened 21st century, amounts to barely disguised bigotry. The Washington Red Clouds? How does that differ from the original choice? [Hint: it doesn’t.] You’re stealing a man’s name to replace a bigoted epithet because the individual’s name sounds vaguely like the status quo. Hmmm. But you have a precedent, you say. The Cleveland Browns were named for one of their own. That’s a precedent for using a dead guy’s name from within your ranks—it’s not carte blanche permission to use any dead guy’s name. The suggested name change is especially tone deaf when you remember that the dead guy’s name and person represent a highlight of Native American resistance to oppression and cultural annihilation. Changing the team’s name to Red Clouds makes. no. sense. at. all. The suggested name change is not just misplaced conscience, it’s what’s known as cultural appropriation. If you’re not familiar with the term or are inclined to pooh-pooh the idea, at left is a cartoon I found this afternoon on the intertubes that helps to make the point. “No, really.” It’s fine! Dress like the people your ancestors persecuted and who your culture made certain would lose all touch with themselves as individuals and as whole cultures, and who you choose, in the present, to marginalize. Honest to gawd, they’ve never met a reality they couldn’t spin to their own benefit. And this piece by Drury and Clavin* only perpetuates the status quo. K. I’m outa here. Sleep the sleep of angels, for tomorrow the battle will be joined anew. * wasn’t he a character in American television’s long-lived sitcom, Cheers? This entry was posted in bigotry, Washington Red Clouds, Washington Redskins. Bookmark the permalink. ← Frayer and RussellI (1987) and Lozano et al. (2013): I Have a Bone Skeletal Element Tooth to Pick with You OR When Does A Shallow Groove Become A Myth’s Shallow Grave? Ives Goddard points out in an article about the word “Redskin” that it was neither offensive nor invented by Europeans.